I’ve realized if you build a house with the intent of having “the house that all the kids hang out at” that this is exactly what will happen! I guess it really is a” if you build it they will come” kind of a deal – which has been so fun and it makes me smile watching the kids enjoy this space that we spent a million hours dreaming and scheming over. I will say, however, that corralling groups of kids everyday has seriously cut into my ability to blog. I promise I’m trying to squeeze it in so that I don’t leave you hanging, but I want to soak up every minute with these kiddos before they are too cool to hang with mom. I did snap a few pics of our entry way while they were still snoozing the other morning (side benefit of spending hours in the pool everyday – they are actually sleeping in and it’s amazing!). It is totally bare bones right now, and I need your ideas for what to hang here. I’m thinking about hanging our family gallery wall from our old playroom above the bench (see it here), but I’m having major new wall anxiety (it’s a thing), and the idea of putting a million nail holes in my pretty board and batten walls is stopping me in my tracks. There is also this big blank wall going down the stairs, I was hoping to hang our big American flag here (see it here), but it was actually too small looking. Can you tell I have no idea what to do with this space?? I think I’m burnt out on decision making after designing every inch of this house, and I need to just let it all marinate for the summer and hope inspiration strikes in the fall. 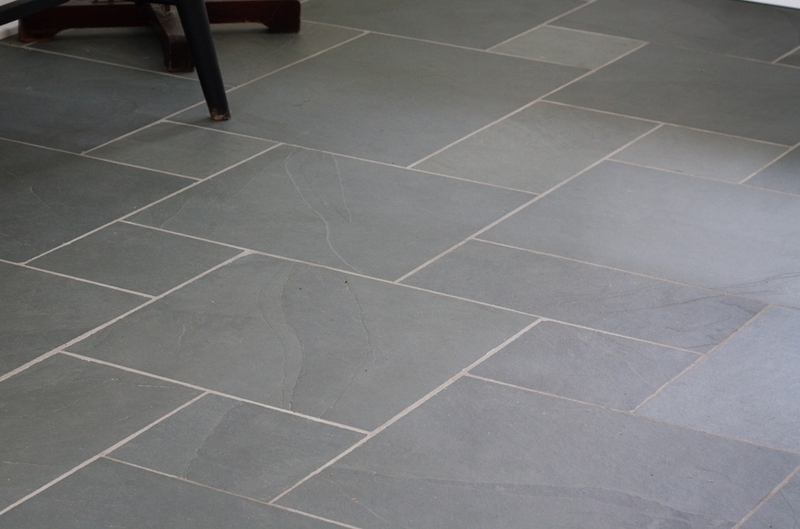 One decision I didn’t need help in making is choosing this gorgeous blue slate tile for our entry way. I partnered with BuildDirect again on this flooring, and I absolutely love it. I wanted to go with really classic and natural finishes that would stand the test of time in this house so this Janeiro Slate Tile was a no brainer. 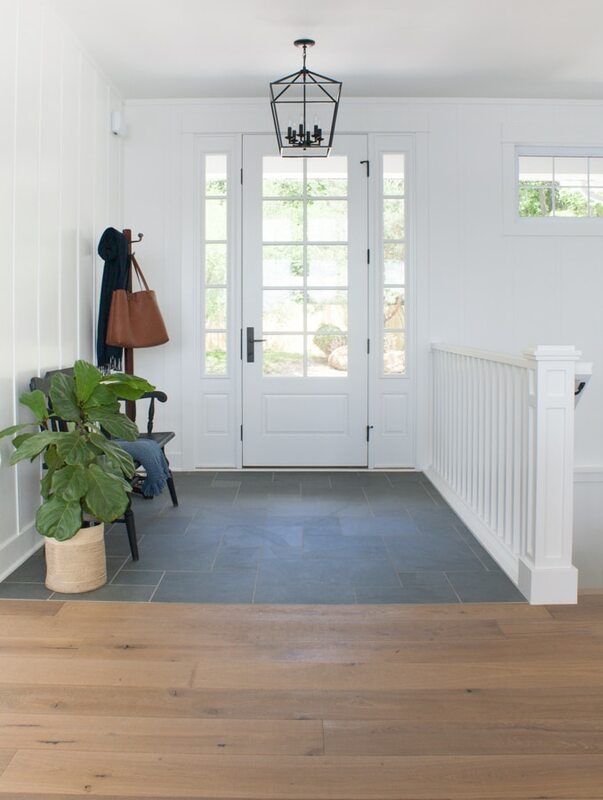 BuildDirect had this tile in black and blue, but I chose the Montauk Blue color, and I love how it plays with the white walls and the warm wood of our floors. We went with the Versailles Pattern (I used this same tile, but a different pattern in the mudroom/laundry room, which I’ll show you soon). It took a bit of extra figuring out for the guys to lay, but it turned out so cool. I went with a light grey grout for a bit more contrast. I should mention a big tip on this flooring is the tile guys sealed it before they grouted it so that the grout was easier to remove. Because this a natural stone, we will have to seal it again every so often. I need to find a rug for in here yet too, but I almost don’t want to cover up the pattern. Obviously, I need some sort of rug in here though. I snagged this bench at a flea market for $15 last summer and painted it black. Our coat rack from the last house looks right at home here, and I managed to keep my fiddle fig alive all winter at my parent’s house even though he really hated it there. He looked pretty sickly the whole time we were there, but he is finally perking up! Also don’t mind the trees out the front door that are now finally planted (more to show on that front in the coming weeks!). Ok, so hit me up with some ideas of what to hang above this bench! Maybe put the American flag above the black bench? Everything looks beautiful and I love reading your posts! And maybe the family photos in the stairwell. It’s gorgeous!!! I was going to suggest the American flag above bench and maybe family gallery on the blank wall by the stairs? Before I do galleries I usually use painters tape to plan out where everything will go so I visualize it better thank so the frames with that Velcro stuff so if I end up hating it I just pull it off so worth it!!! Where did you get that door!?? We need a new front one and I’m thinking something like this would be perfect!! ❤️ following your blog and the progress you’ve made on your lake house! I’ve always loved a big mirror in a foyer – maybe something with driftwood for you – and hang those fantastic family pics on the staircase. You are such a clever designer, can’t wait to see what you do! I would suggest something very simple over your bench, like the other reader’s idea of a mirror/driftwood idea. It is so beautiful the way it is and your walls are truly a focal point so I would put the family photos elsewhere, like perhaps the staircase wall. The simplicity of your foyer will make a statement for guests that conveys a peaceful, relaxing atmosphere, even if it is a busy household!! I think it would look “too busy” with photos in that location. Just my two cents worth! I know with your talents you will find something fantastic to hang there. Thx for the beautiful photos! I think a big beautiful lake painting in blues would be nice over the bench. It would be a hint of what’s to come when visitors get to the main living areas and see the lake out your windows. The blues would play off the slate tiles and it would brighten up the area. 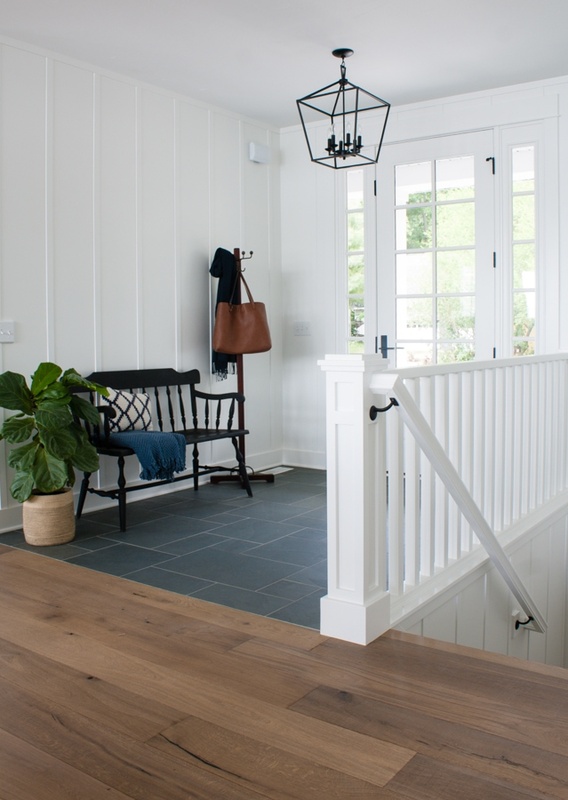 Hanging your family photos gallery style in the stairway would be perfect. Your house if beautiful and I love reading your blog. I was thinking about a beautiful lake picture above your bench. It is nice that I am thinking in the same direction as Pat. I know you will make a wonderful choice. I loved your other house and decor as well. Just be calm and your choices will come to you. You have made many beautiful decisions in your new home. Enjoy your home!! I think you should hang a big oversized clock it would look awesome on your walls! i’d probably wait to decide what to hang on the walls. I pinned this forever ago and loved the simplicity of it, maybe a black frame? Whatever you choose I’m sure it will be beautiful, I love your home! Everything looks fantastic! SO beautiful! I totally understand the new wall anxiety! I just did a gallery wall at my house with heavy wooden signs and I used command strips! I love it! No holes in the walls and I have already moved a few things around as the gallery wall has grown! Just a suggestion but I am sure whatever you come up with will be amazing! I think the family photos seem a little casual for the new entryway. I would save those for the room downstairs. I think that you should select some sort of artwork that sets the tone for the entire house right at the entry. I would look for something that says rustic elegant lakeside charm. Maybe something nautical with boat, water, lighthouse? I’m afraid of nail holes too which is why we switched to 3M hooks for almost all of our artwork. That also lets us easily swap out art for the season. My suggestion is to use those Command hooks so you don’t put holes in that beautiful wood wall. I have no idea what to hang. I still have some bare walls in my house and I’ve lived here 20+ years! I love your entry! I also had new wall anxiety when we built our home, LOL! My son stopped that real quick when I came home to find he’d tacked 20 posters all over his wall! I think a landscape pic or the american flag would look great above the bench. I feel like a gallery wall is usually left for more informal areas, like hallways, etc. Congrats on your new home! Okay, first of all, I have serious house envy. But putting that aside, I always like having a mirror in my foyer for that last minute ‘check’ before answering the door. Know what I mean? And I like the way a mirror can bounce around the light. p.s. I would consider an outdoor throw rug in the entry. They’ve come a LONG way from the plastic-y rugs of old, and are super soft, come in a bazillion patterns, and are so easy to clean. You won’t feel like you need to throw it out after 6 months. You are right on about waiting until you are sure about what to hang. And you could hang them from the molding at the ceiling with beautiful ribbon or fishing line also. This is beautiful!!! Love the slate. I like the idea of the flag over the bench and the gallery wall in the stairwell. And yes, I’d use command strips on all of it just to avoid the nail holes. You are such a good photographer, how about a large photo of the sunset over your lake. That makes it a little more personal. Whatever you do I know it look great! I’m kind of loving it blank. The floor is gorgeous and the plant looks happy. Having said that, I’m sure whatever you put on that wall will be fabulous, maybe a large sign with your family name or LPC2 and est. date of 2017. Maybe using Sticky Tack to hang your gallery would be a nice idea. Then you can remove everything or rearrange just by removing the Sticky Tack product. Honestly, I would hate to distract too much from the beautiful architecture of the entry itself. The idea of nail holes? Yikes! ALSO YOU DONT HAVE TO TAKE CARE OF IT! yaya! I thinking of the beautiful macrame hangings. Some are more modern/ classic looking, no so boho. But utmost would kind of work with the nautical theme…fish net…macrame rope, they even mount them on driftwood. I think it would look amazing. Love the blue slate!! Beautiful. And it’s OK to not make any decisions right now. In time, you will know what you want to do, or maybe nothing at all. Personally, I’m not sure I’d want to cover up that board and batten, it’s gorgeous as it is. Love your new home (and the old one)! Makes me miss Michigan summers. Did you paint the light kits on the pendant lights and dining room lights or is/was there an option for black/black instead of black/chrome? Thank you! HI Kim, when I ordered mine the black/black was backordered they may have discontinued them? I did actually buy the chrome/black and spray paint them, I did it so long ago now I totally forgot! It was a super easy fix if you decide to go that route. Love the floor. I like the idea of a driftwood mirror above the bench!! My entry/stairway is identical to yours, except I don’t have a wall on the left hand side walking in the front door (where your bench is). I put a family gallery on my stairway wall and I love that I can see it from all angles of my great room. Maybe switch your ideas and put the American flag over the bench and the gallery wall over the stairs? Have you ever thought of using the Command Strips that are meant for hanging picture frames? Maybe that’s the solution to your new wall phobia! Command strips has strips for picture hanging. Absolutely love the tile…………..the color, the pattern. Swoon!!! Command hooks will save the walls and the world! It’s beautiful! I would just add a large water/lake scene canvas over the bench! Command strips work for hanging and then you don’t have to worry about holes! Beautiful house. Looks great! Were you able to find out the manufacturer of your front door package? Hi Kristi I just heard back from my contractor the door is made by Thermatru thanks! Looks great! I love the simplicity of it as it is right now. I totally understand the fear of messing up your new walls! 3M strips do help ease that for me! I would do a larger door mat rather than an area rug. The tile is too pretty. 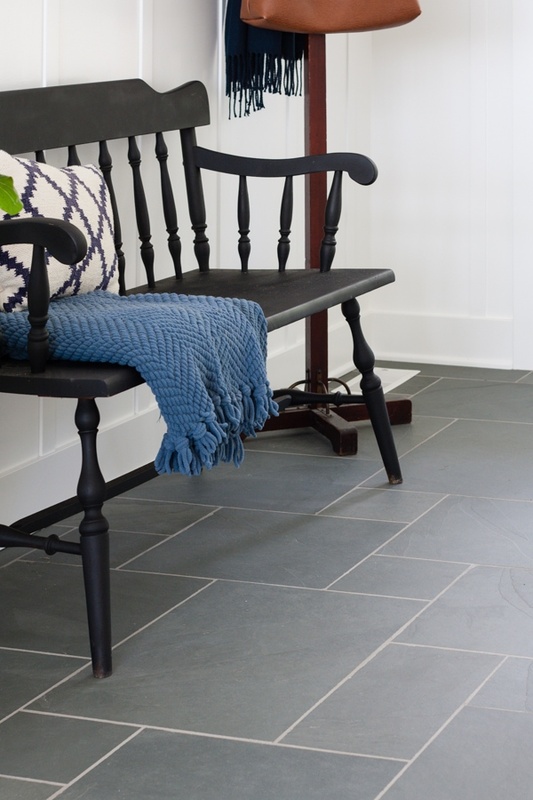 In our entry floor and on the front porch outside, we have matching gray industrial rugs. They are meant for businesses, I’m sure, but they catch so much of the junk that gets tracked in that I don’t have to vacuum as often. I found some at Sam’s Club (years ago!) that had a pretty geometric pattern to the weave. Surprisingly, I have had a lot of complements on my rugs. People ask where I bought them. They are surprised to hear that they are the industrial-type entry rugs. I also have blue tile and gray grout. The gray rugs look great and are very practical with kids running in and out. I love the Ikea picture rails and so does my husband. I put them in the church office for our pastor and he loves the fact he can change pictures as often as he wishes. He has some beautiful art he has collected in his travels and loves the fact he puts very few holes in the wall. You know, the great thing about leaving your walls blank for awhile is that, when inspiration strikes and you begin styling, any small new change makes your heart skip a beat when you see it :). Your house is an inspiration! Great work. Thanks so much Darla, I’m trying not to force it and take my time! I have multiple ideas, wish I could attach a picture to my comments. Hallway: (1) Gallery wall of antique framed shells, see Traditional Home Magazine (Elegant Family Vacation Home Article). (2) Antique Nautical framed Flag. (3) Enlarge vintage era Post Card of your local area (4) Enlarge vintage era Lake Map. Above Bench: (1) your American Flag (2) your Oars from previous home. (3) Unique and simple Oyster shell or driftwood mirror that is not gaudy. The blank walls seem intentional anyways for a clean aesthetic. I am with you on waiting until you find the curated pieces down the road and not rushing the evolution of designing a space for long term. This sounds perfect. I think the hat rack needs to go. Make a clean uncluttered space. Love all of these ideas, thanks for the food for thought!! I was going to suggest #4 of Teenie Lulu’s ideas as well. A large vintage map of your lake area above the stairs would look cool. But then again, if you left everything just as it is and never mentioned anything about hanging something, I’d think it was perfect! I like to take it slow with wall art. Live there a while and enjoy clean walls. I have a feeling something will jump out at you when you find the right piece. And… I am with you. I would be very hesitant to put a bunch of nail holes in that beautiful board and batt. I’m definitely taking my time decorating this time around! Maybe some wooden ore’s or vintage nautical flags or a family crest over the bench area. Your home is quite lovely! I do have a collection of oars I have a plan for! I recently came across a quote on Houzz that made me stop to think: “Seeing too much is seeing nothing.” An empty wall allows one to take in the simplicity and beauty of your home’s architecture, and the view. Additional “stuff” might not be needed for a long time. Completely agree with this. I’m sure some of the suggestions would look lovely, but I’d leave the bench wall, stair wall and stone bare for now. Just a simple doormat rather than a rug. 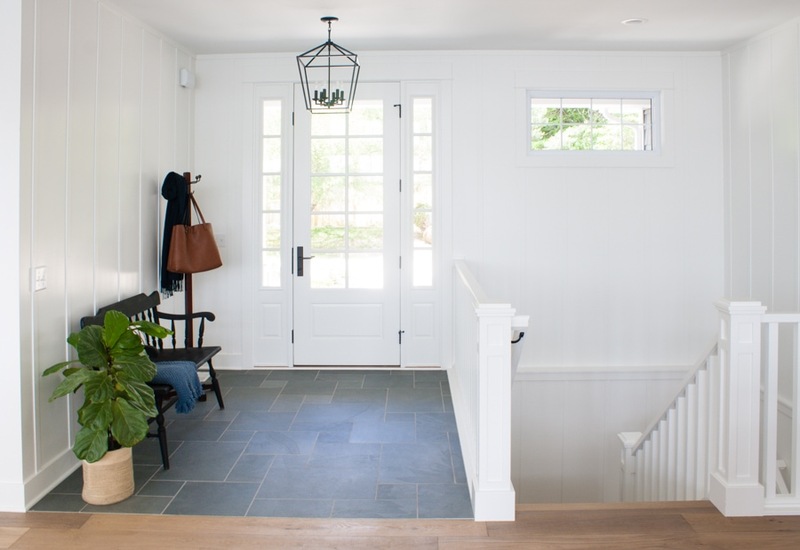 Having white space, especially with the batten there is refreshing, and from the other view point (coming into the house), the white will allow you to properly focus on the view, and you’ll feel lighter, almost without realising it. Don’t rush to fill it for our sakes. Thanks Victoria, I’m definitely living with the house as is for the summer and taking my time! That’s a nice sentiment I definitely don’t want a lot of clutter but I think at least one of the walls needs something. Almost everything in my house is hung with command adhesive. I hate putting in holes if I can help it. I don’t know why I never use those but I’m going to start! Command strips for sure, used them to hang my family photo wall and pretty much everything else. I agree an oversized clock would look great in either space. However, am partial to your flag above the bench, hung with command strips. Hey Linda, it’s hard to tell in the photos but the flag is giant it wouldn’t fit above the bench. Thanks though! Maybe the flag over the bench with a sign over that that says Welcome to the Lake. It’s super pretty, bright and cheerful and I know whatever you decide it will look awesome because you are so talented. The flag is too big above the bench unfortunately but that would have been nice. From a few of your posts, looks as if you have an amazing view of Lake Michigan. Why not take a picture of it, have it enlarged to fit the area above your bench and also framed. Then take three more pictures of the exact same view during fall, winter and spring. Enlarge and frame just as you would do with the summer view and change the picture in your entry way with the seasons. Hi Sue, I wish we lived on Lake Michigan! We are on a much smaller inland lake here in Michigan, but that is a fun idea. Oh I love her style very cool! Also, I forgot to ask, where did you get your stunning front door?! Where are the cool boat oars and canoe paddles from the previous house? Do they have a home yet? Love your idea of just enjoying empty walls for awhile, make sure you love what you are hanging. Your home is beautiful, thanks for sharing, love your blog! I have a plan in place for the oars, hope to show you sooN! You have done a remarkable job of this beautiful home. Give yourself a rest and it will come to you. Make your own decision. You have not made one mistake so far. Trust yourself. Everything is stunningly gorgeous. Be proud. Betty from,Ontario, Canada. Thanks Betty, I’m definitely not rushing the process this time. I appreciate your vote of confidence! I have always loved hanging a cool oversized clock in stairwell/entry walls if it can be seen around the great room. I have a suggestion of what to hang. Take a Picture of the kids jumping off the dock in colorful swimsuits, DONT Overthink it, Then Send it to me and Ill turn it into an ARt Piece! Then I will send the digital file, and you can order a wall portrait just in the exact size. Think of it as a housewarming gift from me! Or you could hang something ROUND. ROUND IS always CALMING and SOOTHING. ROUND MIRROR In Nature there are no straight lines, and houses can get too angular and straight. Round Curves always lower my blood pressure. Just a thought! Such a nice offer Dixie! I think I have a plan for in here now though – thanks! You can see an example I did of my grandson and his friends on my blog. What about your large black and white sign you had up in the flag picture example? It had some saying or verse on it. Beautiful home! I love your Family gallery photos but I am also a fan of having a mirror in the foyer/entry way. I also like the idea of the family gallery for the stairwell. I am sure whatever you decide will look amazing. Your home is beautiful. I also would like to know where you got your front door? I definitely want this for our front entrance. Over the bench- 4 large, framed, black and white photos of sailboats and/or vintage, black and white photos of water skiiers. On the wall going downstairs- Build another larger frame for a larger flag OR hang your current flag horizontally with something “Americana” both above and below it to help fill in the space. I would think a gallery wall in that entry space may end up looking too busy/cluttered. I think one large piece with words would be a nice look. Have you seen the ones done by Tiny House Vintage and Art? I love her work! Hi Kelly! My parents live a few cottages down from you. You’re place is BEAUTIFUL!!! I love the fixtures! Did you order rubbed bronze? Yours look black to me; black is the color I’m looking for but I’m hesitant to order….any advise with the color? Hi Shani! Great to meet a neighbor :) I ordered black ones but the all black were actually backordered (they may still be?) so I spray painted the chrome part on the black and chrome ones. Stop by and say hi next time you are out at the lake! Well, 3M Command Strips, obviously. I agree with the others about switching the location of your family pictures. In your entryway – what about a wallhanging sized quilt done in blues and white? Accent colors of your choice could be pulled in but I’m thinking of the blue-green of the kitchen island and vanities. It’s definitely a warm, homey, welcoming sight. 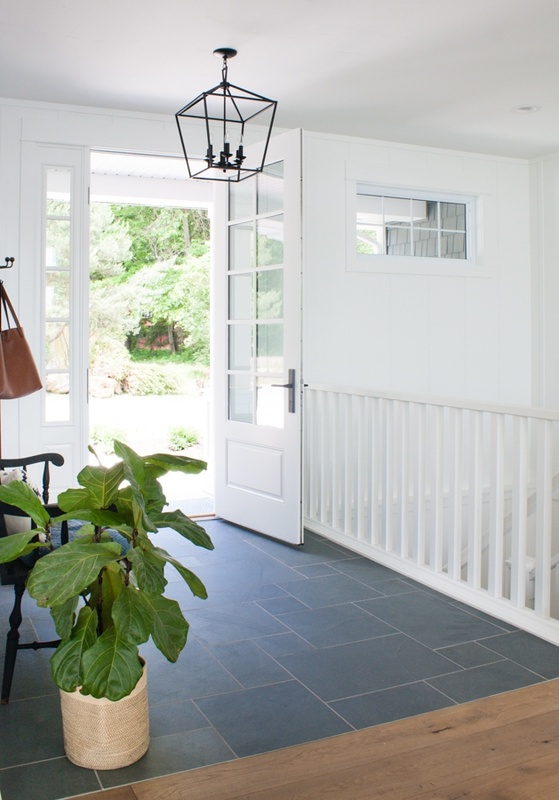 The charming hanging lantern is beautiful, and to me a focal piece. The tile also stunning! 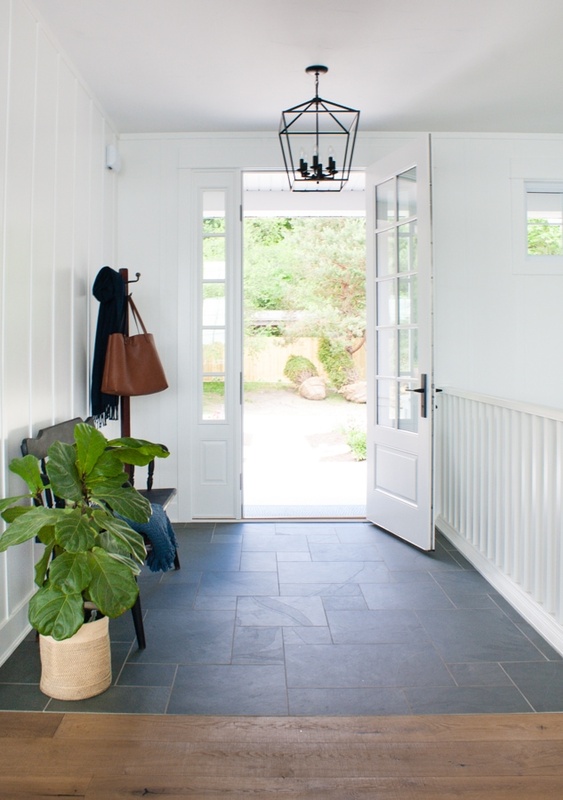 Your entry looks great – the slate flooring is my “go to” for entry areas as well. For above the bench – how about something a little rustic to contrast with all of your (amazing) new finishes. Maybe a single large round mirror with black steel frame. Or the collage wall with family photos all framed in the same black steel – maybe mix in a few acrylic shadow boxes that contain small meaningful objects for a little color. Don’t desecrate those beautiful board and batten walls by putting nails in them! A nice colorful rug (maybe with red/brown tones) will warm that space up and add a little color. The pristine walls are a beautiful thing, and the slate tile looks amazing! Everything looks fantastic! We are preparing ours to sell, so we are going through our home and updating so that when potential buyers come through they will suttley see the hot trends from the high end custom homes. We ship lapped our hearth room and the accent wall runs under the couture top to the kitchen. Added a dark choc hard wood. Looks amazing as if the outside has come indoors with the 5 windows in that room. I have found free downloadable prints that I am sizing to create clusters. Ive chosen 2 architectural prints with dark blue back ground and white lines displaying the design of a ship, The dark blue matches my dark blue tile and the white frame accents the gay walls. I have sea weed photos, agan they ae a blue back ground with the image in white. Ill frame them in white matt with white frame. ( ill take these with us when we move to a small private island in Bluffton SC ) . Since its a lake house, you could use maritime flags to spell out family. Each flag represents a letter, spell out something. Anotehr idea I got was to use old maps. I found map pages from an old book. Way back from the days that they did the maps in colors and very detailed. I’ve chosen a group of 4. One of Montreal Canada, England, Ireland and the Southern states. Essentially our ancestral heritage. I have 4 square boards of weathered wood. 9 x 9 and I have traced an octopus onto the the 4 boards so it in on all 4 boards. Ive seen it done with coral and loved it. An old surf baord on the stairs. Or 4 antique weathered oars. Anything you choose to do will look fantastic. FYI Today I took the paint back to Sherwin Williams for the 3rd time because it is still not the color of gray that I want. We updated our master bath with white and grays stone tile and ship lapped the whole bathroom. Framed out the large mirrors and re painted the light fixtures adding clear crystal and brushed bronze light covers to match the glass nobs. The color was still not dark enough so I pulled up a pin I saved of dark gray cabinets in a white bathroom to show them the contrast I wanted. LOL it was your bathroom. I noticed it when someone next to me wanted to re pin it and we opened the pin. ! You are an inspiration! Changing one home at a time all over! Love the arrangement of tile you chose! Do you happen to know the sizes of tiles you used to make the Versailles pattern? Hi Carolyn you just buy it in the versailles pattern so it sends all the different sizes – thanks! Kelly, I know that this post is now more than a year old, but was wondering if you remembered the grout that you used with the slate? Thanks! Hi Jason, I don’t. It was a blueish gray color though, it was the only one like that my tile guy had. Flooring questions: was the engineered hardwood nailed down to the subfloor? Did you use some type of pad or underlayment material under the hardwood? Thanks! Hey Kelly! Did your husband build your stair railings or did you order it? (And maybe this is in another post that I just totally missed?) We have open stairs in our living room and I really don’t want a half wall. I am leaning more towards spindles like that, but all the ones I find at the lumber shop are old school designed. I love the thicker posts! This made me laugh out loud bc my husband can’t build anything lol! Our trim carpenters did a great job building our stair railings. I think they are just wood posts they ordered from the lumbar yard but I’m not 100 percent sure. I had a hard time explaining the simple ones I wanted too, there are definitely a lot of old school ornate ones out there. Good luck! 😂My bad! I thought I remembered you drawing a design ounce and him making it happen…must have been the builder. I showed my hubby & he thought it wasn’t was doable. (He is our “trim guy” 😉) Much better than the ones I saw in the catalog. Love it! Thanks!